Awesome place! Super friendly people running it! Very helpful! 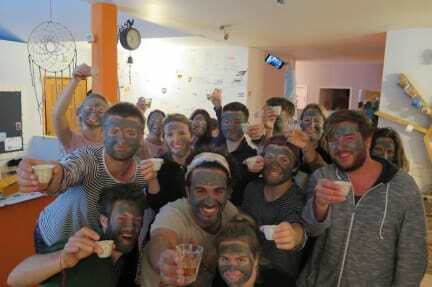 Perfect hostel for exploring the Dead Sea, Masada and Negev desert. Located in a quiet residential area in the town of Arad, the hostel provides everything you need and is clean and well maintained. Nice and comfi place, really feels like a hostel, good place to chill out, nice hiking in the area, staff really knowledgable on that. Too bad it’s so far away from the centre. I like that the place is vegetarian and you can buy small portions of rice, pasta etc. Good atmosphere. Staff cookies a great shabbat dinner. They are fun most of the time but if you ask a question they find stupid/annoying they can give you an attitude. Quiet sleep of time in Israel. Staff courteous. Some descriptions of services misleading. They say: "We offer shuttles to the Dead Sea and Masada" They do not. Will call a taxi for you or if someone is driving and has room in their car and can take you. "Offering shuttles" tells me they will shuttle you to and from these areas without having to cart luggage with you. I would pay for this. This is not what they do. Security: no room key/lock. Not social. Heads stuck in phones/laptops. Limited choice of budget accommodation led us to this hostel. On a basic level, everything works. The beds are comfortable, there is on-street parking and there is a well-stocked kitchen. However, a few bits and pieces made the experience less than ideal. Contrary to previous reviews there is no breakfast provided, hiring a towel is an extortionate 15 shekels, there is a 3% surcharge on paying with a card (the nearest cash machine is in town, 5 mins drive away). All-in-all an average hostel. Staff weren't very inviting or sociable. They were in the middle of cleaning and making the hostel prettier, which is important, but we got the feeling that was more important to them than their guests. Lots of chill spaces to hang out, but didnt feel very relaxing with lots of controlling signs everywhere about rules. Also the location is far from the Dead Sea and downtown so the location rating on this site is a bit misleading. When we arrived, no one in the office, we can only see him 2 days later.During our registration, he force us to give everybody's passports and visas for him to make a photocopy of which no other hostel doing the same and said that we can leave in case we do not follow his rule. That was 9pm at night. Don't get me wrong, the hostel was Okey. It was a bit far from shops and restaurants. The main problem is that we didn't get the information we needed, even thou we had e-mailed beforehand. And then we get attitude for not knowing it. We had been to the dead sea so was a little salty and wanted a quick shower before going on a 3 hour bus ride to Tel Aviv. I am aware that we had checked out, but only an hour prior, it did not seem like a big deal. It's a shower.. but was denied. The hostel was freezing. They would leave all the windows open and the front door open, and it was not warm outside. On multiple occasions, we didn’t have hot water for the shower. The shower was gross and there was mold all over the windows. I would not recommend staying here.